ABOVE: If you stay at the Hotel Palafitte, splurge on a lake pavilion. INSET BELOW: The bottom of Lake Neuchâtel, viewed from a floor-level window. Switzerland is justly celebrated for its hotels and modern architects, and the Hôtel Palafitte shows what can be accomplished when hoteliers and designers collaborate with a budget of 20 million Swiss francs. The hotel, which lies on the outskirts of Neuchâtel in French-speaking Switzerland, is one of the most distinctive hostelries that you're likely to encounter. 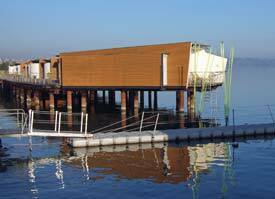 It's also said to be the only hotel in Europe that's built above water, with 24 of its 40 "pavilions" or junior suites perched on pilings over Lake Neuchâtel. The Hôtel Palafitte was built as a temporary structure for Expo.02, a Swiss exhibition that took place in 2002. It was financed by the Sandoz Family Foundation (which also financed the Riffelalp Resort above Zermatt) and was designed by architect Kurt Hoffman of Lausanne, Switzerland. The goal was to create a state-of-the-art, 21st Century hotel using "sustainable architecture" that would allow the hotel's components to be rebuilt or recycled after Expo.02. In the end, the hotel was such a hit with architectural critics, guests, and local tourist officials that the Swiss government granted permission for it to stay open despite laws that normally forbid structures over public lakes. Besides having an aquatic setting, the Hôtel Palafitte makes use of environmentally friendly features such as solar panels for hot water and electricity, heating with biogas from kitchen waste, and rainwater collection for toilet flushing. The hotel was also designed as a showcase for Siemens electronic technology, although some of the leading-edge features from Expo.02 (such as biometric fingerprint scanning in lieu of room keys) have fallen by the wayside for reasons of practicality or privacy. It's a hotel that would appeal to a Google engineer, a Microsoft programmer, or a smartphone addict.